This truly suggestive picture, taken, as you know, by the NASA - Dawn Spacecraft, shows us, once again, the Features of Occator Crater (approx. 92 Km - such as about 57,132 miles in diameter and about 4 Km - such as roughly 2,484 miles - deep), located on the Dwarf-Planet known as 1-Ceres, and which is - litterally - the "home" of a real and - relatively - large collection of intriguing "Bright Spots". As a matter of fact, the aforementioned Bright Spots are way much brighter than the rest of 1-Ceres' Surface, and therefore they tend to appear quite overexposed in most of the images which have been taken so far. However, this view is a composite of two images of Occator Crater: one obtained by using a short exposure, that captured the details of (in) the Bright Spots, and one where the Background Surface was captured at a normal exposure. 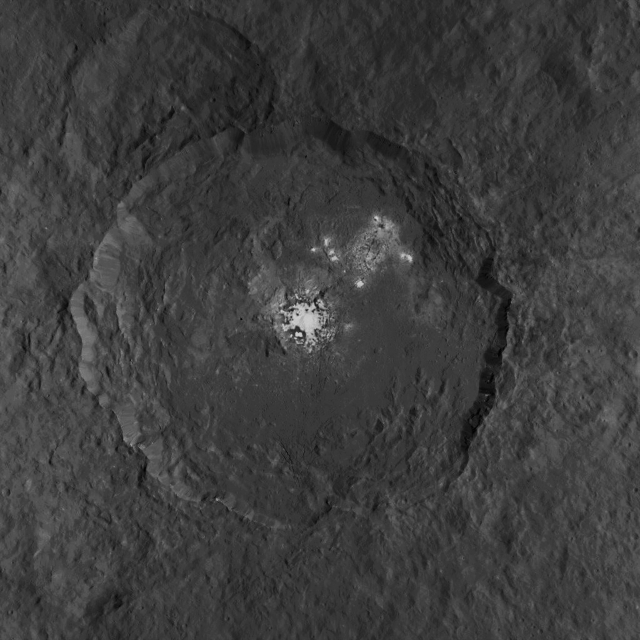 These two images were both obtained by the NASA - Dawn Spacecraft during the Mission's High Altitude Mapping Orbit (or "HAMO", for short) Phase, from which the Spacecraft imaged (and it is still imaging) the Surface of 1-Ceres at a resolution of about 450 feet (such as approx. 137,16 meters) per pixel. This image (which is an Original NASA - Dawn Spacecraft's b/w and NON Map-Projected frame published on the NASA - Planetary Photojournal with the ID n. PIA 19889) has been additionally processed, extra-magnified to aid the visibility of the details, contrast enhanced and sharpened, Gamma corrected and then colorized (according to an educated guess carried out by Dr Paolo C. Fienga-LXTT-IPF) in Absolute Natural Colors (such as the colors that a normal human eye would actually perceive if someone were onboard the NASA - Dawn Spacecraft and then looked ahead, towards the Surface of 1-Ceres), by using an original technique created - and, in time, dramatically improved - by the Lunar Explorer Italia Team.